I noticed websites had embedded YouTube videos and not a single age restriction/login prompt. After making such an observation, I tried embedding videos in a simple custom HTML page and it worked! Ever wanted to watch a movie trailer on YouTube only to be asked to login to view it? Then you decide the movie isn’t to your liking, but Google thinks you like this type of movie and start showing weird videos/ads suggestions? I got fed-up with that. Guess what? There’s an easier and simpler way to do it than manually coding an HTML page every time: JSFiddle! Voilà! Problem solved. Google won’t ask you to login and won’t associate the viewed video to your account, since you’re not logged in. Right? 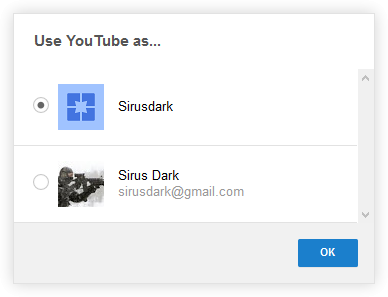 It seems Google creates a completely NEW account under that name, instead of simply being an alias or a reference. I haven’t found how to fix that crap and I apologies for not providing a how-to as I usually do. So in the meantime, I’ll keep looking, but if anyone happens to know how to fix that crap, lemme know!